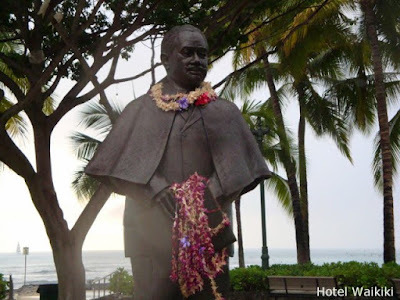 I bumped into Prince Kuhio while I was strolling along the beach, about 5 o'clock, on a late wet Tuesday afternoon. If it's anything note worthy, Prince Kuhio bequeated Waikiki Beach to the general public. 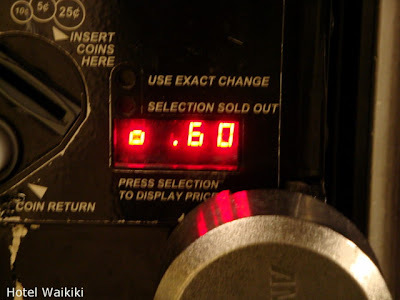 ....60¢ for a can of Pepsi at a soda machine for hotel employees. Even took a picture of it as proof of purchase. A can of soda is usually at least 75¢ just about everywhere else that I'm personally aware of. Yeh, I go around checking prices on soda machines that are tucked in nooks and crannies islandwide. Almost started a blog on the very subject, and I still may. Say I'm on a date, take her to my secret soda machine, and while we're at it, "Honey, Long's Drugs has a sale on potato sticks." Soda and potato sticks, who could desire anything more for a night out on the town. I'll stress that candle light and wine are so overated. Even if it includes a dinner that isn't presented on a paper plate with plastic utensils wrapped in a paper napkin. Joking. I repeat, "I was just joking." Anyways, I remember, or simply can't forget, this restaurant review written about the restaurant that's located on the top of the EiffelTower, Maxim's (? ), where the reviewer noted something along the lines, "....to dine at Maxim's will stand as the biggest thrill of your life....until presented with the bill." Never been to the top of the Eiffel, only hung around the bottom, hemming and hawing over if it was worth the ride up. Anyway, I have one possible explanation as to why Maxim's is so pricey.....with all of that xmas-y lighting going on at the Tower (or at least it was lit up like a xmas tree when I was there in summer), somebody has to foot the electric bill, so it may as well be the snoots who have fat enough wallets to eat atop ET in the first place. Rowena- the Eiffel Tower must have been a spectacular sight looking up from the base. I've never been to Paris. Anyways, usually the patrons of expensive kind restaurants aren't spending their own money. If they are they're usually rich enough that a diner at Maxims is like us buying a can of soda. Make that....spending a week in Paris and having dinner every night at Maxims....is equivalent to the average person buying a can of soda. I think potato sticks and soda is fine food for a date. Heck, as long as it meant I got to stay on the beach, i would be pleased. I'm relatively easy to please. I guess you could get fancy and have a $1 handroll or shave ice.